Food is pretty much a recurring theme on this blog at this stage. I am surprised really that it hasn’t been the dominant topic on here much sooner as I am CONSTANTLY thinking of food. I am one of those people who are eating dinner in the evening and thinking about what to eat the next day. One of my most favourite (and saddest) games is to look up the menus of restaurants I may potentially go to and decide what I would choose from the menu. Luckily I will not bore you with the results of such a weird pastime here, nor will I share with you any cooking attempts or disasters. Instead I see this post as an emotional outreach to my fellow Irish expats. This post will be dedicated to the foods I miss from home. Recently I came to the conclusion that I don’t really miss food from home anymore. But I was wrong. I do. Not all of it but quite a number of things. Luckily I have a wonderful friend named Helen who was able to come to Berlin with a few treats, namely Lucozade, Tayto and mushy peas, to tide me through until I return home in August to restock. Find the wonderful Helen over at: www.anseo-a-mhuinteoir.com. You can buy Tayto online (here) but the delivery price can be a bit steep and it is only from the Northern Ireland factory. I thought you could buy them from the Republic but I cannot see this option online anymore. Correct me if I am wrong and send me the link! 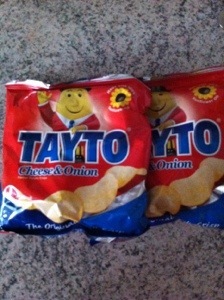 You just can’t live your life without a stinky bag of cheese and onion Tayto once in a while. With some other products or dishes from home I am a little more lucky. When I am feeling a little flush, I head out to an Irish bar to have some fish and chips drowned in vinegar! I wrote a post over on the Wimdu website which lists my favourite bars outside Ireland. This list was compiled before I found The Castle Pub in Gesundbrunnen though which is now on top for me. I certainly recommend checking them out. A full review will come when I go back again and can take some pictures! Now the sad part. Sometimes it is not always easy to go out to eat, especially when I want to stay in my PJs all day. That is when I need to have a stock of goods for myself. For the little bits and pieces I just have to have in my cupboard, I head to a store called Broken English whom have a good selection of products from the homeland, as well as three locations across Berlin. Vinegar and Robinsons drinks are always on my list here! 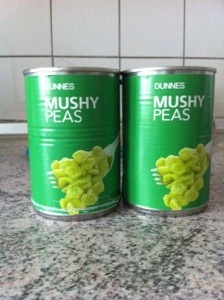 Here are the mushy peas! Head over and ask Helen about the journey they had here. There are some things that you can’t find in Berlin though like a good cup of Barry’s tea – something my fellow Corkonian boyfriend likes to have in the apartment at all times. That is when I had to go all detective and find some alternative shopping places online. It didn’t take my long to come up with Viking Direct. What a gem! They have Barrys AND Lyons tea! The sugar in the tea (bad pun alert) is that when you buy 2 boxes of tea, you get some free biscuits! They also sell my beloved Robinsons! Irish food hampers! A great gift so says my biased self. This was a bit of a long-winded post but I couldn’t help get a bit passionate. If there are any links you guys know of where I can get food, drinks, cosmetics or anything else not available in Germany, then do let me know. I will be forever grateful!